Product information "Triglyceride Colorimetric Assay Kit"
The measurement of triglyceride levels, in conjunction with other lipid assays, are useful in the diagnosis of primary and secondary hyperlipoproteinemia, dyslipidemia, and triglyceridemia. 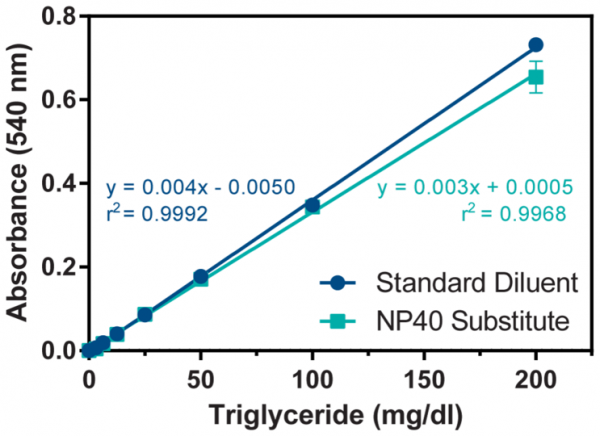 Cayman's Triglyceride Assay Kit provides a simple, reproducible, and sensitive tool for assaying triglycerides in plasma, serum, cell lysates, and tissue homogenate samples. The assay is initiated with the enzymatic hydrolysis of the triglycerides by lipase to produce glycerol and free fatty acids. The glycerol released is subsequently measured by a coupled enzymatic reaction system with a colorimetric readout at 540 nm. Customer review for "Triglyceride Colorimetric Assay Kit"